Ten days into 2014 and Physics has already started to take over my life! Still finishing off PhD applications, I am also starting my specialist research project and helped out at the Stargazing Live event hosted by Leicester University this Wednesday. It was a fantastic evening filled with presentations and a host of exciting experiments, all geared towards inspiring young minds to take an interest in Astronomy and Physics. I was one of two undergraduates running the comet-making workshop, which managed to feature in East Midlands Today! During the workshop we made comets out of a few simple ingredients. The recipe works on the premise comets are basically dusty balls of ice. As a comet’s orbit takes it close to the Sun the ice vaporises, releasing gas and dust. This debris forms a tail which can be up to 10 million kilometres long! The dust also reflects the sunlight, forming a glowing ball of light called the coma at the front of the comet and also causing the tail to glow. Therefore a comet is invisible until the ice begins to vapoursie close to the Sun. 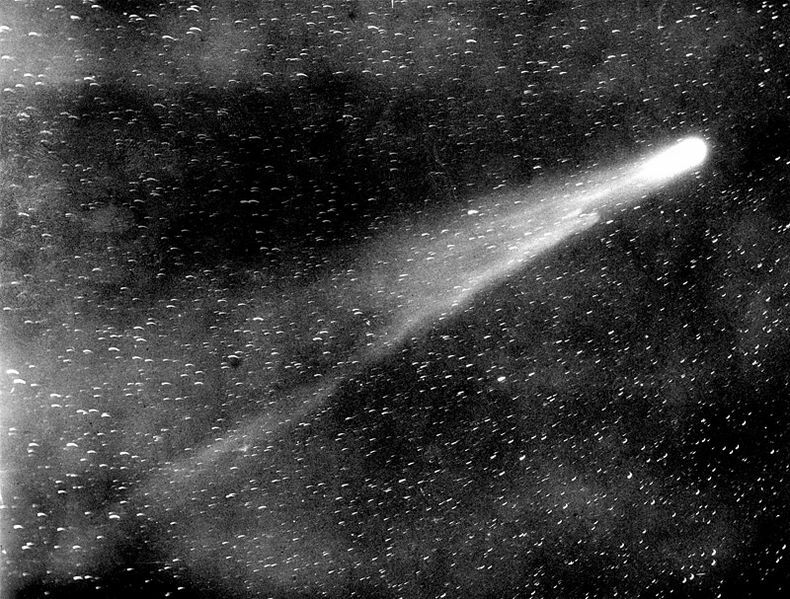 A photograph of Halley’s comet in 1910. The comet is named after Edmund Halley, who predicted the period of its orbit of the Sun (approximately 76 years). It is due for a return in 2061! At the centre of a comet is a solid nucleus, typically a few kilometres long. Surrounding this is a mix of water ice, silicates, frozen carbon dioxide (or dry ice), methane and ammonia. In order to make our comets we also use dry ice and water, though instead of ammonia and methane we use something equally smelly – Worcestershire source! We also put some sand – or silicates – into our comets, however the most interesting ingredient by far is the dash of soil we stir into the mix. In 1999 NASA launched the Stardust spacecraft and sent it to analyse the dust tail of a comet called Wild 2. In 2006 Stardust returned to Earth after travelling a whopping 2.88 billion miles! Later scientists were astonished to find the amino acid glycine in the sample of the tail collected. Those of you taking Biology A-level/ IB will be familiar with the term amino acid and will understand the implications of this discovery. For those unfamiliar, amino acids are the building blocks of life. They are fundamental constituents of our DNA and therefore dictate everything about us. Consequently, if they are present in comet Wild 2, this acts as evidence that life may have been bought to Earth on a comet! For more information on this discovery click here. The soil therefore represents organic (carbon-containing) molecules, such as amino acids. 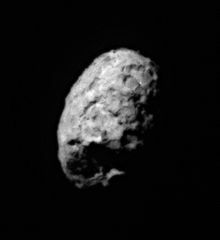 Image of comet Wild 2. During the evening we had comets of all shapes and sizes and some were more successful than others! I haven’t found the magic recipe for the perfect comet yet, a lot of it seems to be down to luck! Lilian has now graduated from the University of Leicester and is no longer blogging for this site. Lilian was blogging as a fourth year MPhys student, explaining how Physics can be rocket science – but then it can be chemistry, nanotechnology, biology and astronomy too.